Raumfahrt+Astronomie-Blog von CENAP - Blog: Astronomie - Sieht so ein Alien aus? Is this what an alien looks like? In a galaxy far, far away, Darwin’s principles still hold firm, scientists predict. Andrew Masterson reports. An octomite: is this what alien natural selection may produce? Assuming the concept of recorded language, and overlooking the possibly immense challenges of translation, silicon-based, nitrogen-breathing extraterrestrials might rather enjoy reading Darwin’s On The Origin of Species. At least, that may be the case if a team of astrobiologists and zoologists at the UK’s Cambridge University are correct in their assumptions. In a paper published in the International Journal of Astrobiology, scientists led by Samuel Levin from the university’s department of zoology argue that aliens – regardless of their fundamental chemistry or whether they possess some kind of analogue to DNA – will still be subject to the pressures of natural selection. The general framework of natural selection, they argue, implies that any and all alien species across the universe are, like those on Earth, subject to pressures that result in them becoming fitter over time. Such an approach can explain how complexity arises in space. The model, they suggest, moves astrobiology forward, because previous attempts to predict what forms alien life might take have rested on largely mechanistic principles – taking earthly examples, combining them with our knowledge of chemistry and geology, and extrapolating from there. “In our paper, we offer an alternative approach, which is to use evolutionary theory to make predictions that are independent of Earth's details,” says Levin. As well as the basic pressures of natural selection, the team also factor in the well-supported observations that evolution on Earth has been affected by significant transitional phases – the evolution of prokaryotes, for instance, and then of multicellular organisms. Spurred by transient extreme conditions, they write, a similar punctuated equilibrium could be expected during the development of life systems on other worlds. “We still can't say whether aliens will walk on two legs or have big green eyes. But we believe evolutionary theory offers a unique additional tool for trying to understand what aliens will be like,” explains Levin. 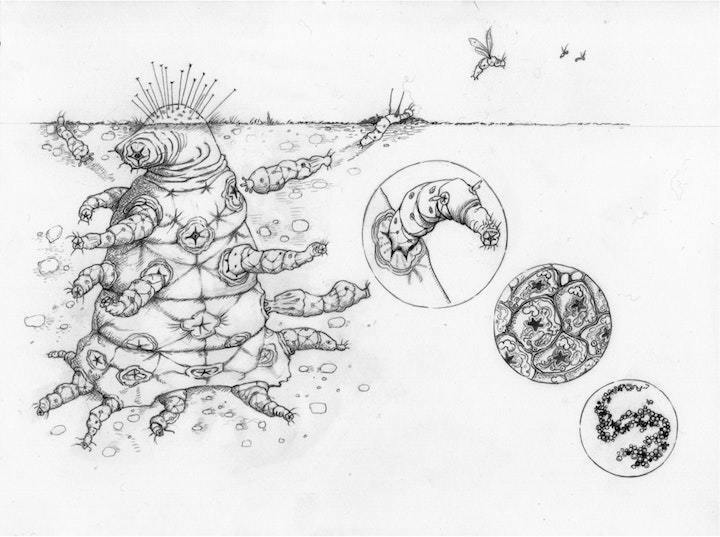 Based on these principles, one of the team, Helen Cooper, went so far as to offer a tentative design of what a naturally selected alien might look like. She calls the creature the Octomite, and describes it as “a complex alien that comprises a hierarchy of entities, where each lower level collection of entities has aligned evolutionary interests such that conflict is effectively eliminated.